Citations and use in other compositions, see Fallows 1999 pp. 260-261. Edition: Barbireau 1954 Vol. II p. 13 (Dijon). vuidé de joye et de liesse. suis sans nul espoir d’alegence. am I, with no hope of relief. drained of joy and happiness. 4) Dijon and Leuven, line 12, “pourtant m’apellon …”, Nivelle, “m’apelle par oultre cuidance”. Moreover, there are many differences in spelling. Nivelle belongs to a tradition different from the others by its use of the common letter-clefs (G2, C3, C3), while the Dijon and Laborde scribes try to reproduce the song in fa-clefs (on letter- and fa-clefs see further ‘On chansons notated in fa-clefs’), and Leuven shows up a sort od ‘reduced’ fa-clef notation. It has no letter-clefs, but one flat only in each voice, in the upper voice on the 3rd staff line and in the lower voices in the 2nd space. This obviously means that letter-clafs must be imagined, namely G2, C3 and C3, which produces a song in high range (e-g’’) with a key signature of one flat. The Leuven scribe also used this type of notation in his copy of »Comme femme desconfortee« on ff. 25v-27 in his chansonnier. Furthermore Nivelle and Leuven are modernized with smoother melodic lines and no transgression of one of Tinctoris’ contrapuntal rules (see below). They share this “modern” tradition with the younger Savoyard chansonnier, Paris 2973, and some traits with the Florentine chansonniers, Florence 176 and Paris 15123. The important points in the modernization of the music are: 1) the division of the dotted longa in the tenor into a longa and a brevis, which is found in the mentioned sources plus, of course, in the Mellon Chansonnier, New Haven 91; 2) the reversal of the dissonant notes in the tenor bar 8.2 – this is in Nivelle, Leuven and Paris 2973 only; and 3) the smoothing out of the octave leap in the contratenor in bar 13 found in Nivelle, Paris 2973, Florence 176 and Paris 15123. Dijon, Laborde and Pavia 362 share all the traits mentioned unaltered, the dotted longa, the dissonant tenor, and the leaping contratenor, but other details disclose that Dijon and Laborde were copied from different exemplars. Most important is the different use of ligatures in note repetitions in the tenor bars 8-9 and 24-29, which makes the underlay of the text much easier in Laborde. The scribes of Laborde and Dijon did not understand its fa-clef notation. The Dijon scribe placed the flats in the upper voice exactly as in the lower voices (fas2, fas4, see Example 1); they were probably placed one step higher (fa3, fa5) in his exemplar. The Laborde scribe could not get the clefs to make any sense, so he wrote them apparently at random, letting them vary from staff to staff (see Example 2). To get an impression of the song’s original notation we must look at the clefs transmitted by some slightly younger sources, which were copied with greater care and understanding. Florence 176 has a set of fa-clefs, which conforms perfectly to the model with interlocking fifths (see Example 3; on the interlocking fifths model, see ‘On chansons notated in fa-clefs’, Figure 1). This means that according to a default reading the flats from top to bottom designate the following scale positions: in the upper voice f’’, c’’, and f’, and in the tenor and contratenor f’ and b-flat; and it produces a tonal layout widespread in the middle of the century with an upper voice with a flat less than the lower voices. We find exactly this layout again in the contemporary Paris 2973 (Chansonnier Cordiforme) and in the older Nivelle Chansonnier, but now in pitch locked notation with letter-clefs: G2 without flats and two voices in C3 with one flat – Cordiforme has even retained the single f’’-flat, which also can be used to warn the singer that the music exceeds the Guidonian gamut by using a high ficta hexachord on c’’. Pavia 362 also locks the pitch of the chanson (see Example 4), but only in the upper voice, which has a G2 clef without flats, while keeping the three-flat clefs in tenor and contra, which then must be read as f’, b-flat and f. Unlike the Nivelle, Pavia 362 and Paris 2973 the Florence 176 version is not locked to any pitch, and it can just as easily be performed a fifth lower by imagining a different set of letter clefs: C2 with one flat and F3 with two flats in the lower voices. Paris 15123 (Pixérécourt MS), also from Florence and possibly a few years younger than Florence 176, transmits the song in a different configuration of fa-signs (see Example 5). It corresponds to the fifths-fourths model described in ‘On chansons notated in fa-clefs’ (Figure 1) and produces a default reading of the flats in the upper voice as c’’, f’ and c’, and in the tenor and contratenor as c’ and f – a fourth lower than in MS Florence 176, and no key signature is needed in any voice. It was probably such a combination of fa-signs that the Dijon scribe saw in his exemplar when he was copying the song into his own collection. A default reading of Dijon with amended fa-clefs in pure G Mixolydian can be found in the PDF-edition mentioned above. Of course, this set of fa-clefs may also be read with imagined letter clefs, in C-Mixolydian with one G2 and two C3 clefs, all with a key signature of one flat (“Variant reading a” in the same file), and a fifth lower in F-Mixolydian with one C2 and two F3 clefs, all with two flats (“Variant reading b”). The Leuven version apparently has been ‘reduced’ from this version of the fa-clef notation. 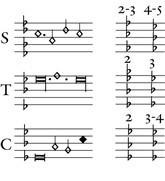 By keeping only one flat in each voice it forces a reading corresponding to the C-Mixolydian with a signature of one flat (like Dijon’s “Variant reading a”). New Haven 91, the Mellon Chansonnier, does not specify the fifth in its upper voices (see Example 6). It could refer to any of the two models, but most probable it is meant to be read with the last mentioned combination of letter-clefs in mind, one C2 and two F3 clefs, now with one flat in the upper voice and two in the lower voices. If we presume that the Laborde scribe in some instances got the clefs right, and that he in the 2nd and 3rd staff of the upper voice and in the 2nd staff of the contratenor (see Example 2) really wrote what he saw in his exemplar, then Laborde could present the same set of clefs as Florence 176. It could be performed at any pitch, but an obvious reading is – like the Mellon Chansonnier – the one in low clefs (see the edition). This reading of Laborde is interesting because it conforms perfectly to Tinctoris’ example from Barbingant’s song (see below). Tinctoris’ and the assumed Mellon low-clef reading of “L’omme banny” can also be confirmed by a responce to the song, the anonymous »L’omme qui vit en esperanche«, about the man who lives in hope, in the Pixérécourt MS (Paris 15123), ff. 182v-183, which cites the beginning of Barbingant’s tenor and paraphrases its structure and cadential scheme (see the edition). Here a set of C2, C5 and F3 clefs is combined with a setup of flats very like the ones in Barbingant’s song in Paris 15123 (and probably Dijon). Given the co-existence of as well the most old-fashioned tradition represented by the Laborde scribe as the modernized versions in Leuven and Nivelle during the late 1460s the song clearly must belong to the the older segment of the repertory, from the 1450s or earlier. The name of the composer is found in the Mellon Chansonnier, which was prepared or supervised by the Johannes Tinctoris in Naples around 1475, and it is confirmed by his quote of the beginning of the song under Barbingant’s name. (3) Barbingant was a French composer flourishing in the middle of the century and was highly regarded by writers as Eloy d'Amerval and Guillaume Crétin. A younger Italian source, Florence 176, ascribes the song to the contemporary French composer Johannes Fedé (alias Jean Sohier), but Tinctoris’ ascription must be regarded as the authoritative one, not least because he lived and worked in Northern and Central France during the years when the song found favour. Nivelle Chansonnier contains three chansons attributed to Fedé, all copied by the Nivelle scribe, but the MS’s version of ‘L’omme banny’ is anonymous. This, too, speaks against Fede’s authorship. Tinctoris censored Barbingant in his Liber imperfectionum notarum musicalium of 1474-75, because a note, which has been augmented by a dot, of course cannot be imperfected by a following short note, and he gives the start of the superius and tenor from Barbingant’s “L’omme banny” as an illustrative musical example – in F-Mixolydian and low clefs. (4) In the tenor the first longa is augmented by a punctus additionis but then shortened by the following semibrevis, which to make things clearer in some sources is followed by a punctus divisionis (see the Laborde incipits in Example 2). We only find this ‘error’ in the older sources (Dijon, Laborde and Pavia 362), while the younger sources have corrected the error by dividing the long first note into a longa and a brevis (which can be imperfected correctly), but so did also Nivelle and Leuven, which probably can be dated earlier than Tinctoris’ Liber. This sad song about a man abandoned by all pleasure is memorable first and foremost for its opening gesture. The desolation of “L’omme banny” is expressed by the very long notes in the tenor. Their setting refers in melodic contour and sound to contemporary settings of drawn-out tunes, especially in sacred music: The countervoices to the longae values move using the safe intervals of 3-5-6-5-3 in complementary rhythms, which produce an ‘enlivened’ static harmony well-known from masses building on cantus firmi in long note values – or from improvised polyphony on cantus planus. The remainder of the rondeau is varied and compact. The second line “vuidé de joye …” is declaimed much faster than the first words, and the second section of the rondeau has snippets of canonic imitation at the octave (bb. 15.2 ff) and at the fifth (b. 23) between superius and tenor. The contratenor is placed in the same range as the tenor and weaves around it often filling out in fauxbourdon-like passages. In sound and harmonic development this song is in line with some of Binchois’ songs as for example his famous “De plus en plus se renouvelle”. Also here the final cadence comes somewhat surprising. The opening pitch of the tenor is through the setting accentuated as the primary note, and one’s ears willingly accept this step as the tonal goal. Only the medial ending and the final cadence compel the song into a Mixolydian mode a fifth higher than expected. Maybe the song should be performed with a short refrain (bb. 1-9) after the first couplet as well as after the tierce – then it would end a fifth lower. For an aesthetic evaluation of the song it is important to keep in mind that in its original notation, probably as transmitted by Florence 176, it could sound at any pitch, even at a very low one as attested by Tinctoris. The very high tessitura presented by the versions in Leuven, Nivelle, Pavia 362 and Paris 2973 was a convenient way of ‘translating’ the fa-clef notation into a more modern system. 1) The song and its sources have been discussed several times in the scholarly literature, cf. Jeppesen, La Frottola II (1969), pp. 14-16, and Urquhart 2004, pp. 373-375, which both include tables of incipits. 2) Fallows 1999, p. 261. 3) Cf. Perkins 1979 and Woodley 1988, pp. 188-194.